Some people naturally prefer to share what they have, instead of keeping it to themselves. While this idea of sharing is something we are taught from a young age, not everyone is great at it when they merge into adulthood. 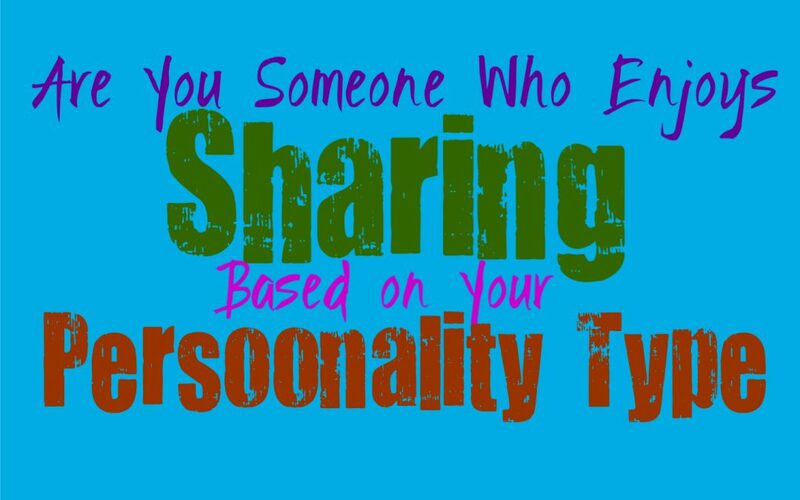 Here is how good you are at sharing, based on your personality type. INFJs actually enjoy sharing with others, as long as it is someone they care for. They enjoy being able to share what they have in an open and compassionate manner. INFJs can contradict themselves though, since there will likely be certain things they struggle to really share with others. They might have a special person who is excluded from this, since they do enjoy having that type of connection where they want to share just about everything with someone. For the INFJ it all depends on the person and situation, but deep down they do want to be someone who shares what they have with others. ENFJs are naturally giving people and so they feel comfortable sharing most of the time. They don’t hold things to themselves when someone else is in serious need. ENFJs are compassionate and strive to be able to provide for others as best they can. They are often driven to help those around them and sometimes this means sharing when they can. Most of the time ENFJs are open to sharing and don’t become too upset by this, even with things they might have less of themselves. For the INFP it often feels nice to share with someone they love, but they can be somewhat possessive over certain things in their life. If they have something that means a lot to them, it can be hard for the INFP really share with someone else. They care deeply and don’t do this to hold out from someone, they just have certain things which they hold as personal and they can have a hard time really sharing or letting go of these things. For ENFPs sharing can actually be challenging sometimes, especially with things that hold a personal value for them. They can be somewhat possessive over certain things which means a lot to them, and in these situations the ENFP might struggle to really share with someone else. When they really care about someone they do want to help them, and so they do their best to share when they can. ENFPs just work hard to maintain independence and personal space, and so sometimes sharing is challenging. INTJs can sometimes struggle with the idea of sharing things, since they are independent people. For the INTJ sharing knowledge is important and is the one thing they are more than happy to share with others. They want to spread knowledge and help people learn how to remove the ignorance in their lives. INTJs do sometimes have a hard time sharing things they have worked hard for, since they believe that it is important to maintain independence and work for what they have. ENTJs can actually be good at sharing with the people they love and provide for. When the ENTJ has people in their life who are truly special to them, they have a hard time refusing them when they need something. They can often be good at sharing with these special people, and do whatever they can to take care of them. ENTJs sometimes struggle to share with outside people though, and are more likely to keep things close and only connect with people they love deeply. INTPs can actually have a hard time with sharing in most situations, simply because they are independent people. They keep things personal to them, and are very much inside of their own minds. Sometimes INTPs hold these belongings personal and so it makes it feel strange to share with others, especially if someone forces this upon them. INTPs can be very giving people though, but they want to get someone their own things rather than share with them. While ENTPs can have a giving side, they aren’t necessarily great at sharing. They sometimes are possessive of their own items and want to keep things to themselves. When someone they love is in need, the ENTP is more like to find a way to get them whatever it is they desire. Instead of sharing their own items, the ENTP just finds a way to get something new. This is simply because they like having things to themselves and prefer to main a sense of independence. ISTJs are actually very capable of sharing, especially with their family and loved ones. They do whatever they need to in order to provide for the people in their life. ISTJs are naturally providers and sometimes this means sharing what they have with someone else. They might not be great at sharing with outsiders, but when it comes to what they have they often reserve this for the people closest to them and are protective in this way. ESTJs are good at sharing with their loved ones, and will do just about anything to provide for their needs in this way. When the ESTJs cares for someone they will work hard to provide for them and make them happy. Sometimes this means they will be willing to share what they have in order to please them. ESTJs might have a hard time sharing with strangers though, and often reserve what they have for the people closest to them. ISFJs are often compassionate and giving people, and so sharing comes naturally for them. They will do just about anything to make their loved ones happy and go above and beyond for them. ISFJs are often good at sharing with others as well, not just their family and close loved ones. They care about making people happy and are naturally people pleasers. They are happy to share with others, especially when they are deeply in need. ESFJs are often great at sharing most things, especially with their close loved ones and family. They are naturally people pleasers and want to do whatever they can to make others happy. They don’t want to feel like they have failed or disappointed someone, and so ESFJs will often give up what they have for someone else. The only time ESFJs might struggle to really share with someone, is if they have items that are sentimental and mean something to them. ISTPs aren’t usually comfortable having to share with others, simply because they are independent people. This doesn’t mean they aren’t capable of giving or helping people, they just want to keep certain things to themselves. ISTPs aren’t necessarily incapable of sharing though, especially with things they have plenty of to go around. They simply are very internal people who keep to themselves most of the time, and might not even realize that they should share something they have. ESTPs don’t mind sharing with people they love and care for, but can have a hard time with outsiders or strangers. Their personal things are very important to them, and they can have sentimental connections with these items. Because of this ESTPs don’t find it easy to share most things in their life, unless it is with someone truly special to them. In these situations they do like being open and enjoy being able to give to someone they love. ISFPs don’t mind sharing to the people closest to them, but they can actually be possessive with certain items. They often hold an emotional and sentimental value to a lot of their items, and so it actually become difficult to really share with others. For the ISFP it isn’t about being selfish, it is just that they would become truly upset if something they loved was destroyed or lost because someone didn’t care for it properly. ESFPs can often share openly with their family and loved ones, and actually enjoy being able to do this. They can sometimes be people pleasers and enjoy being able to see other people happy. If they feel like sharing will impress someone or make them feel pleased with the ESFP, they do their best to adhere to this. They are especially good at sharing with their loved ones, even with items that mean a lot to them.